Holographic sparkly 'Happy Diamond Anniversary' party banner, length 2.7m/9 ft long. 6ft (1.82m) APPROX. IDEAL FOR ANY SILVER ANNIVERSARY CELEBRATION. HAPPY ANNIVERSARY BANNER. 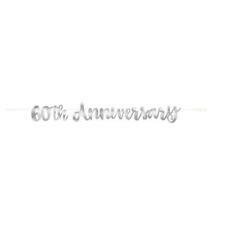 60th ANNIVERSARY BANNER. 5ft (1.52m) APPROX. IDEAL FOR ANY DIAMOND ANNIVERSARY CELEBRATION. 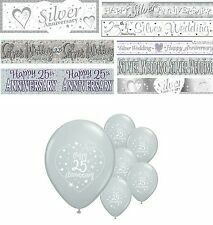 Holographic sparkly 'Happy Silver Anniversary' party banner, length 2.7m/9 ft long. If preferred this banner can be cut into 3 smaller 3ft banners. 12ft Happy Anniversary foil banner. Silver banner with pink and purple print and heart design. We pride ourselves in providing the highest quality products at a great price. Bright high quality print. PERSONALISED WEDDING DAY, ENGAGEMENTS, ANNIVERSARY BANNERS L@@K!!! Happy Anniversary Foil Banner This banner is designed with silver hearts and stars and the phrase 'Happy Anniversary' Banner is approx 9ft long and can be split into smaller banners or used as one long banner Huge range of Wedding and Anniversary party items available Payments can be made direct by calling 0113 2000265 - Monday to Friday 9am - 4.30pm Delivery. Length:- 9ft (2.74m). Diamond Anniversary Foil Banner. "Diamond Anniversary". OUR BANNERS MAKE GREAT SASHES. Approximate Length: 2.5m (can be cut into 3 smaller lengths). 25th SILVER WEDDING ANNIVERSARY FOIL BANNER. IDEAL FOR ANY SILVER ANNIVERSARY CELEBRATION. This Diamond / 60th Wedding Party Bundle includes x2 - 60" GIANT BANNER / 60th DIAMOND WEDDING DECORATION - used. th Anniversary Napkins - new. th Anniversary Bunting - NEW. x1 - Diamond / 60. GIANT 60th ANNIVERSARY BANNER. IDEAL FOR ANY DIAMOND ANNIVERSARY CELEBRATION. 20" x 60"(50cm x 152cm) APPROX. 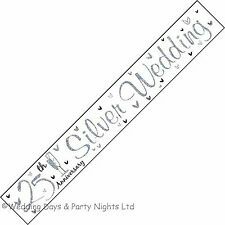 Title :- 25th Silver Wedding Foil Banner. 25th Silver Wedding. Anniversary Foil Banner. 5ft (1.52m) APPROX. 25th ANNIVERSARY BANNER. IDEAL FOR ANY SILVER ANNIVERSARY CELEBRATION. 10ft (3m) APPROX. HAPPY 25th ANNIVERSARY LETTER BANNER. IDEAL FOR ANY SILVER ANNIVERSARY CELEBRATION. HAPPY ANNIVERSARY LETTER BANNER. IDEAL FOR ANY SILVER ANNIVERSARY CELEBRATION. Material: Card. Length: 5 ft (1.52 m). Happy Anniversary Silver Foil Banner With Hearts. Ideal for an Anniversary. Length Approx 9ft/2.7m Long. Silver Foil Letter Banner. Happy Anniversary.